A high percentage of people over 50 years of age will have osteoarthritic changes in their joints. Some studies show that only around 30% of these people will complain of pain. When it comes to the knee, the ‘wear’ or degeneration can occur in any or all of the 3 compartments – the medial (inside) aspect of the joint between the femur and tibia, the lateral (outside) part, or the patello-femoral (knee cap) joint. The severity of pain is associated with the degree of bone marrow damage, whether there are cartilage tears, or synovitis. 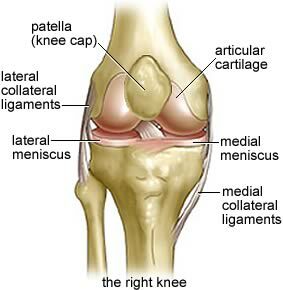 Another very likely source of pain is the fatpad below and behind the patella. As a result of pain, muscle use decreases and the strength and timing of muscle control around the knee changes. People in pain change their patterns of movement to protect their painful knee joint. This tends to lead to increased stresses on other parts of the body. Treatment therefore must unload painful structures and decrease swelling. Therapeutic taping works well to do this. Then training can begin to regain quadriceps control. It is important too to train the ‘core’ muscles and the gluteal muscles so that they co-ordinate well to manage the position of the knee during movement. Exercises may include small squats, specific weight-bearing gluteal exercises and hip stretches. Guidance may be needed in ways to move from sitting to standing and climbing steps. It is important to consistently practice the exercises and strategies prescribed by your Physiotherapist. They need to become part of life forever.